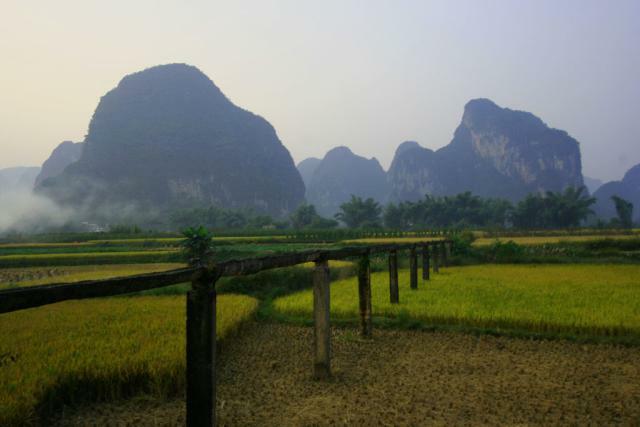 Wanting to see the karsts in their natural surroundings (i.e., not in the middle of a bustling city), we made our way to Yangshuo, an hour south of Guilin. 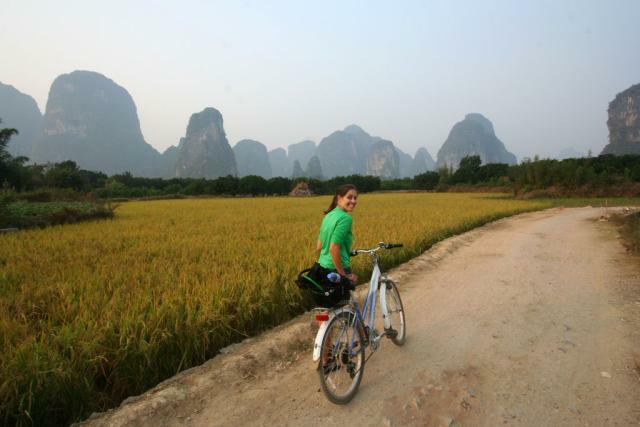 Our first order of business was to rent bikes and hire a guide who could show us the way off the beaten path. We wound through the spectacular countryside, following dirt roads through rice paddies and small villages. We climbed Moon Hill, one of the karsts in the area that has a hole near the top that is said to resemble various stages of the moon, depending on one’s vantage point. We sailed down the Yulong River on a bamboo raft. Yangshuo is a photographer’s dream. Everywhere we looked, another National Geographic-worthy shot appeared. We must have taken 300 pictures during the course of the day, and I’m pretty sure our guide developed a strong hatred for us and our cameras. Here’s a link to some of our best shots. 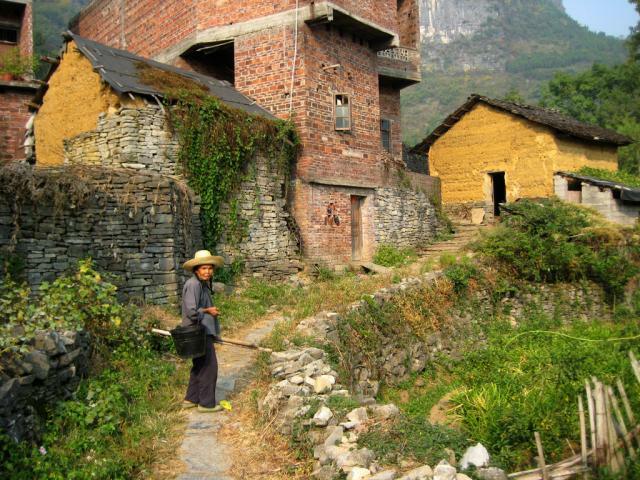 Prior to our arrival in Yangshuo, we read about a nearby village, Shitoucheng, that was only for “adventurous, independent travellers.” Clearly, we had to prove our worthiness as backpackers by checking it out. After a series of trips on local buses (which we navigated mainly by miming, as we’re desperately unable to retain all but the most basic Chinese words), we commandeered two local men on motorcycles to carry us up the karst peaks to Shitoucheng’s new village. 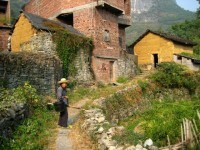 One of the men stayed on to lead us to the old village and the ancient walls that we had come to see. An hour’s worth of steep, rocky stairs later, we were hiking between the walls (whose history seems relatively unknown) and through fields of rice and chili peppers. We took a look around a family home, which had no modern amenities in sight, and then wound our way back down to the new town, whose satellite dishes (even though attached to wooden shacks) seemed futuristic in comparison. Later, we joined thousands of Chinese tourists for Impressions Liu Sanjie, a light show that featured 600 locals–many of them fishermen–performing on (yes, on!) the Li River amongst 12 majestic karsts. The show was directed by movie maker Zhang Yimou, who is also in charge of the opening ceremonies of the 2008 Beijing Olympics. If what we saw was any indication, everyone watching the Olympics will be in for a treat.